The insurance industry has always been rooted in tradition. And that has worked fine, until now. In the 21st Century, it isn’t that insurance is fundamentally changing, it’s actually the behavior and expectations of consumers that have changed. And these changes are making their way through everything from how leads interact with agents to customer experience expectations to how products and services are delivered. Obviously, technology has played a massive part in this disruption. Access to more information has made consumers more empowered in their choices and decision making. They now place a premium on simplicity, access, and personalization. Brokers and agents that don’t understand that and aren’t looking for ways to meet these growing needs right now are going to be left behind. The first place they need to look is at the customers of the future — Millennials and Generation Y. It’s these customers who are driving the trend away from traditional models and towards a digital future. The dependence on mobile devices doesn’t just impact personal life. They are also playing an increasingly important part of life at the office, too. Tech savvy Millennials are now approaching mid-career stages and are in positions to act as key decision makers for companies. Recent research has found that 73% of Millennials at B2B brands are involved in the decision making process for products or services at their company. 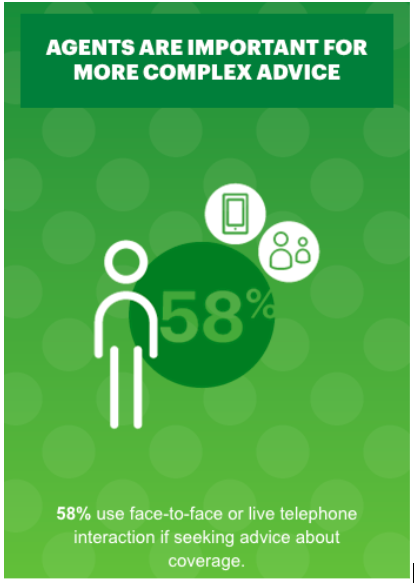 In addition to that, 82% of those Millennials surveyed think mobile devices are important to researching products or services for their brands online. These consumers are also playing a role in how the customer experience is changing as well. Millennials increasingly care about speed of service, the ability for self service options, and are much more likely to leave a company if they had poor interactions. This generation is a key component behind the shift to digital, and brokerages need to keep up. When it comes to insurance brokers and agents, this data cannot be ignored. The brokerages that don’t create user experiences around these specific needs are going to struggle to keep up with the competition. The time for change is here, and technology will play a significant role. 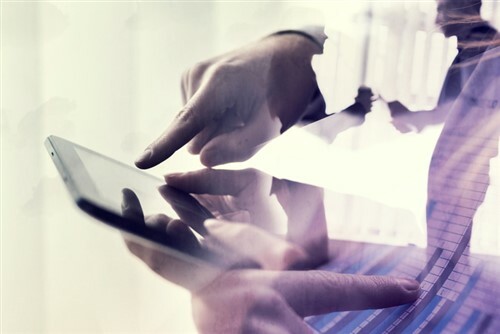 Here are three ways embracing technology can significantly improve business prospects and meet the demands of insurance consumers in the digital age. The unique demands and needs of consumers mean brokers and agents are being challenged in new ways. But, this also represents a significant opportunity that well-positioned brokerages can capitalize on now and into the future. To start, brokers and agents should understand the particular needs of both their current and target customers and build a digital strategy around those. Consumers are already heavily reliant on digital products and services now. Consumer behavior expects that they will be able to both conduct transactions online and access their information with ease. They are also focusing on self service options as well, they’d like to be able to perform simple tasks in their own time through a web portal or app. However, that doesn’t mean they have no interest in speaking with agents and brokers. In fact, research shows that when it comes to more complex policies, customers would much rather speak with an agent or broker. Speaking face-to-face or over the phone is still a key skill for agents and brokers to have. In the age of digital, providing outstanding customer service still stands out. And this is another area where technology can make a difference. Smart management platforms use predictive analytics and automated insights to provide better service to customers. In a few clicks, agents and brokers can provide personalized information for leads and customers based on the data they’ve provided and past interactions. Rather than a list of generic products that might be a fit, consumers can be educated by their agents as to exactly what is going to work for their businesses. A focus on this type of service, utilizing actionable intelligence, can help brokers and agents provide all sorts of value adds to customers. Which, in turn, can help translate to increased customer retention rates, up-sells, and cross-sells. We can do so much with data and technology, but if you don’t know how to use it then it’s almost as bad as having nothing to work with at all. Brokers and agents today need to have data on their customers and leads, not only to be more successful in closing, but also to provide enhanced customer service. Technology solutions. Plug-and-play, cloud-based insurance management platforms are replacing antiquated clunky legacy systems. These new platforms allow brokers and agents to develop more streamlined processes for serving customers and closing deals. In addition, they can be implemented modularly, piece by piece, with only the most needed and necessary components to serve the particular needs of customers. Predictive analytics. Smart platforms allow brokers and agents to anticipate. They can see patterns of behavior and when customers would need to engage with their agents in order to get more information and renew policies. This sort of intelligence can also be used to spot opportunities for other product lines and services. Personalized touch. Technology provides the means for new types of products, services, and business models that are personalized and tailored to their specific needs. These seemingly small changes can end up dramatically increasing retention rates and the success level of brokers and agents. And these changes can turn into a massive competitive advantage over other brokerages that are slow to change to today's quickly shifting and technology-dependent landscape. Improvements in technology aren’t merely there to help customer-facing brokers and agents. The entire office can become more efficient with the implementation of these insurance platforms. Traditionally, information has been siloed across brokerages. Agents and brokers who wanted to find information on a client might have to search through a number of physical files, or systems, or even departments to find what they need. That can hamper customer service and increase the potential for errors. When it comes to accessing data, the back office needs the right information as well. Systems that provide a unified view of clients and leads can streamline processes, reduce errors, and remove many tedious manual tasks from daily work. Also, keep in mind, technology is changing at an exponential rate. It might have taken 30 years for us to get to this point, but it certainly won’t take that amount of time for the next future of the distribution cycle to be here — likely it will only be a handful of years. 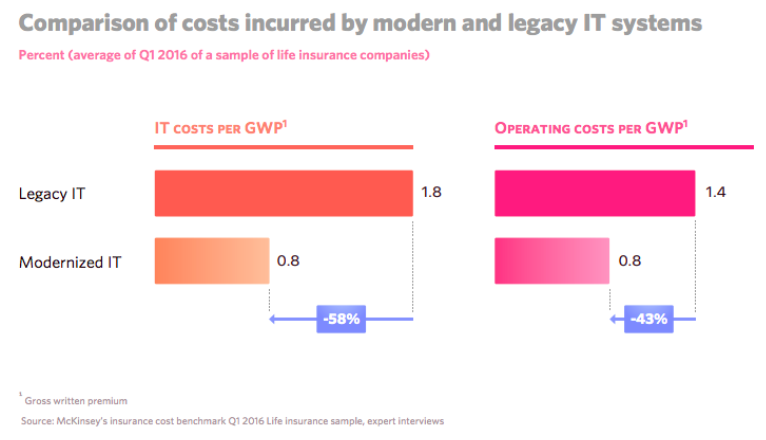 Here’s where cloud-based insurance management systems have a massive advantage over an older legacy systems. Legacy and enterprise systems are notoriously difficult to upgrade without a substantial cost, both in time and expense. A good platform for today must also be a good platform for tomorrow, or in other words, “future proof”. A smart, well-designed system will roll out automated updates on a regular basis, boast an adaptable central business logic, and utilize a modular structure so that deeper cutting changes can be integrated without too much disruption or pain. Finally, automation does more than save time, it saves money as well. Cost and time savings are factors that do make a difference in the day-to-day operations of the business over the long run. As you can see from the chart above, the cost savings are significant. And these savings can be reinvested into the brokerage, exploring new lines or services to offer, or improving IT training, for example. For brokers and agents that want to be on the cutting edge of technology, improve their sales, and offer better customer service, shifting to digital makes all the sense in the world. The advantages you’ll see making the transition will help you set the stage for tomorrow and the future.